Volkswagen is stepping up its game in the EV space. The German automaker is aiming to introduce more than 30 electrified vehicles by 2025, and to sell two to three million of them a year, in response to the Volkswagen emissions scandal. To show it’s serious electric cars, Volkswagen has been rolling out a series of concept vehicles, like the BUDD-e electric microbus shown at the Consumer Electronics Show in January, which you can see above. The BUDD-e is meant as a modern spin on a beloved Volkswagen classic, but it’s doubtful it would have the same appeal as the classic Volkswagen Microbus, also known as the Kombi, if it were to go into production. The fridge on my Volkswagen Westfalia can be a wonderful thing that you love having along, or a sour disappointment that plagues your trip. The difference? Circulating some air inside the damn thing. Lakeport Bryce Allemann’s 1967 Volkswagen bus isn’t just a piece of history — it’s a connection to his past, to his family. In the 1970s, he and his brother and sister piled into the Westfalia Tin Top Walkthrough for family hiking and camping trips up and down the California coast. First, the Volkswagen belonged to Allemann’s grandparents, but when they grew too old to keep it running, his parents received the car. For a number of years the car sat broken down and unused, until Allemann obtained his driver’s license. His father said he could drive the bus if he fixed it up. So Allemann got to work. I never thought I would camp, any more than Harley Sitner ever thought he would own an auto shop. For years, Sitner’s own Westfalia Vanagon had taken him to a Seattle mechanic. But the business was about to close, and Sitner, a former Microsoftie and entrepreneur who logged years in the tech trenches in Bay Area and Seattle startups, saw an opportunity. Hannover, 10 June 2015 – Advance sales of the new California have started at dealerships in Germany. Prices start at €41,429.85 (Beach with 62 kW TDI). In order to further resemble the iconic design, the modern Volkswagen Camper will need to share three design cues, found on the original. The front must have a very short overhang, wherein, the distance from the A-pillar to the front must be silly short. In addition, the new Camper will have to carry a wide, solid, D-pillar and the middle section needs to be as boxy as it can be. We’d suggest a split windscreen, chrome wiper blades and some white paint on the tyres to complete the picture. A next-generation Volkswagen Westfalia is slated to be unveiled on April 15th, meaning a new generation can get its camping on in the cozy confines of a German-built bus. While it will only be a concept to begin with, if Volkswagen does decide to bring the famous microbus back, it could be as an electric vehicle. That’s the word from AutoCar, which got the info from Volkswagen board member Dr. Heinz-Jakob Neusser. 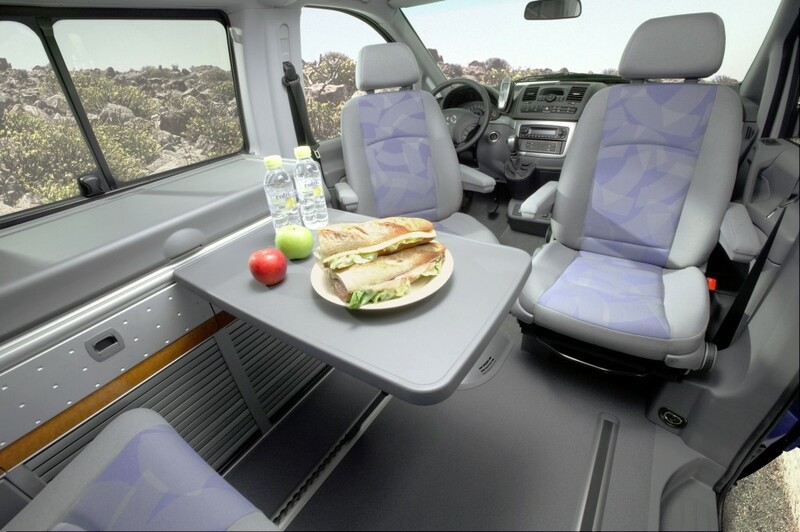 The new Volkswagen Transporter would use a front-mounted electric motor with batteries installed beneath the floorboards, and its design is said to be heavily influenced by the microbus of yesteryear (which really only went out of production a few years ago). if Volkswagen could managed to bring the costs in line with expectations, than a concept could actually become a production model…especially if those 400-mile solid-state batteries work out. A 21st century Volkswagen Westfalia with days worth of electricity on board to power your outdoor adventure is a tempting thought indeed. A word of caution though. Volkswagen has teased the idea of an electric Transporter revival before, most recently with the Bulli concept that debuted waaaay back in 2011. Four years later, and still no new microbus. However, electric vehicles are much farther along today than they were in 2011, and this time around Volkswagen might actually be able to make good on their promise. In other words, it’s alright to get your hopes up, but be prepared for disappointment too. My 21st century hippie wife will probably be the first person in line for one too. I’ll tell you what, it’d make a great vessel for travelling to music festivals. A plug-in hybrid would make even more sense for those who want to get as far removed from civilization as possible, but with 250 miles of range I could find plenty of peaceful places to park my electric Westfalia. Maybe this time, Volkswagen won’t wimp out. Christopher DeMorro A writer and gearhead who loves all things automotive, from hybrids to HEMIs, Chris can be found wrenching or writing- or else, he’s running, because he’s one of those crazy people who gets enjoyment from running insane distances. Toronto Blue Jays 21-year-old pitching prospect Daniel Norris used his $2-million signing bonus to buy a 1978 Volkswagen Westfalia camper van, which he plans to live in during spring training as he’s done the last two seasons. The van, nicknamed Shaggy after the Scooby-Doo character, will be Norris’s home for the next 2 1/2 months in Dunedin, Fla.
Norris, originally from Johnson City, Tenn., recently spoke to the Toronto Star about his van. Q: How’s Shaggy (his beloved van) holding up? A: She’s good. I was away from her for a few days, but it’s good to be back now. Q: So you’re living in the van all through spring training, not just while you’re on the road? A: Yeah (laughing). It’s a full-time gig. Q: Where do you park it? A: I usually park on Honeymoon Island (a public beach about a 10-minute drive from the Jays’ spring-training complex in Dunedin.) I talked to one cop who patrols the area and he said he was cool with it, but he’s only there Thursday through Sunday, and his partner who covers the other three days isn’t cool with it. So I park at the Wal-Mart Monday to Wednesday and then move to the island. Q: What’s the best thing about living in a van? A: Being by yourself, making your own decisions and not really answering to anybody. Not that I don’t like being home with my family and stuff, but sometimes it’s nice to just be alone and take care of yourself. It makes you get up and do stuff. You can’t just sit in there and watch TV. I mean, you can, but it’s not comfortable. Being alone so much you learn about yourself. Last year especially I really started thinking deeper about myself and what it took to get me going. It’s definitely taught me a lot. Q: What’s the worst thing? A: Every year I’ve gotten a lot better at packing lighter, but still it gets messy. I’m not OCD or anything, but there’s times when I just want to throw everything out. You have to be organized or else it starts to feel really cramped. Q: How do you decide where to stop on the road? A: I always make a point to stop at Folly Beach and Charleston. That’s a really beautiful area. But other than that I just go wherever. I’ll buy, like, $20 of gas and then stop when it runs out. I’ve done that a number of times. Norris pitched 6.2 innings for the Blue Jays last season. Unveiled this week in Germany, the new Marco Polo camper from Mercedes-Benz is several cuts above your average bargain-basement mobile home. In October 2012, Adam and Emily Harteau decided to cast off the definition of “normal” life, hop in a tricked-out Volkswagen Westfalia van, and drive from California to Tierra del Fuego in South America. They planned to return one year later. If you’re thinking this merely sounds like an extended road trip, you should consider that Emily and Adam took their daughter Colette, then 21 months old, with them.